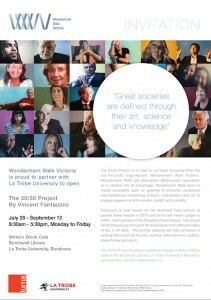 The 30/30 Project is on loan to La Trobe University from the not-for-profit organisation, Wonderment Walk Victoria. Wonderment Walk will strengthen Melbourne’s reputation as a creative city of knowledge. Wonderment Walk aims to create accessible open air galleries of artworks, sculptures and installations combining science, mathematics and art to engage passers-by with wonder, delight and curiosity. Fantauzzo is best known for his Archibald Prize portrait of partner Asher Keddie in 2013 and of the late Heath Ledger in 2008 – both winners of the People’s Choice Award. His unique 30/30 Project saw him paint 30 Australians, from different walks of life, in 30 days. 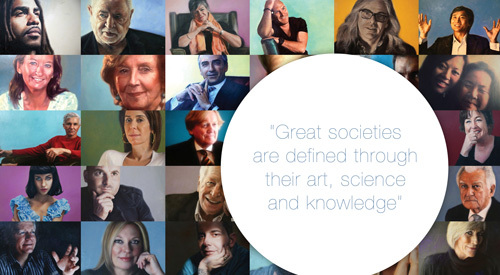 The portrait subjects are high achievers in varying fields such as the arts, science, entertainment, politics, philanthropy and sport. The 30/30 Project Exhibition will be on display in Writer’s Block Café in the Borchardt Library, La Trobe University’s Bundoora campus from July 28 to September 12.